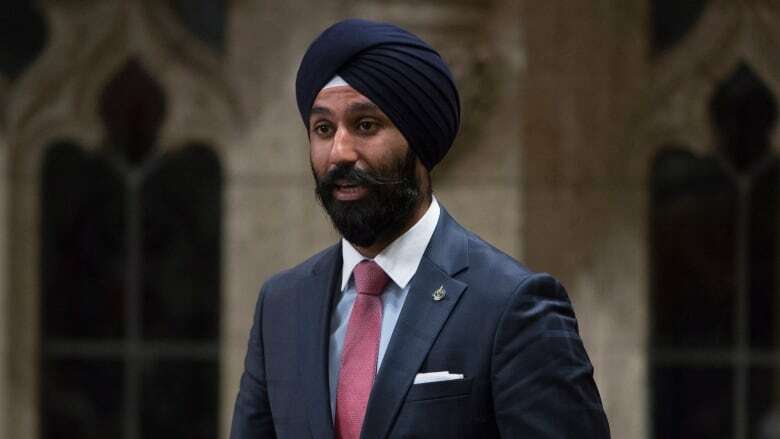 Liberal MP Raj Grewal has announced his intention to leave the party caucus, but will stay on as an MP for the time being amid questions surrounding his conduct and gambling addiction. In an 11-minute video posted to Facebook late Friday night, Grewal addressed multiple allegations against him raised in the House of Commons and in legions of media reports. "I know my silence this past week has raised questions and speculation – and for that, I truly apologize," he begins. Grewal then launches into an exhaustive, detailed account of his version of the events since he was elected to his Brampton seat in 2015. He explains he frequented the Hilton hotel in Gatineau, Que., which houses the Lac-Leamy Casino. What started as recreational blackjack spiraled into a "significant problem," he said, as he accumulated millions of dollars of gambling debt in high-stakes games over three years — which he hid from his friends and family. Grewal said he would routinely borrow money from his loved ones to continue the pattern, and no money was obtained illegally. "I want to make it clear, that every single personal loan made to me was by cheque. Everybody has been paid back, and every loan and repayment is transparent and traceable," he says in the video. His problem gambling was hidden until Nov. 5, when he revealed his addiction to his family. Shortly after on Nov. 19, Grewal said he notified Prime Minister Justin Trudeau's office about his mental health issues. Two days after, in a conversation with government whip Mark Holland, they concluded he would likely have to leave caucus. On Nov. 22, Grewal said he would resign his seat. "Based on these circumstances, we agreed that his decision to resign as Member of Parliament for Brampton East was the right one," a statement at the time from Holland's office said. But in the days that followed, no formal announcement of a vacant seat in Brampton East came. "When we met he said he was resigning as a Member of Parliament. It was my understanding that that was going to be imminent and I suspect that that is something that he will be doing in the very short term," Holland, the chief government whip, later told CBC News. The Friday video dispelled the notion that Grewal would resign as MP. "I've decided that I will be leaving the Liberal caucus and taking a leave of absence to focus on my mental health and recovery," Grewal stated. "I will be making a final decision about my political future before Parliament resumes in the new year." Holland confirmed on Twitter Grewal is no longer a member of the Liberal caucus. "I confirmed, in writing, earlier this morning to the Speaker of the House of Commons that Raj Grewal, MP for Brampton East, is not a member of the Liberal caucus." The question marks that remain concerning his conduct have become fodder in the House of Commons. "We've learned that the gambling debts of the Liberal MP for Brampton East came to light as the result of a police wiretap," Conservative MP Mark Strahl said in question period this week, citing media reports. "The wiretaps were part of an OPP investigation into, quote, 'particularly shady guys' suspected of money laundering and terrorist financing. When did the Prime Minister's Office first learn about this serious investigation involving a sitting Liberal Member of Parliament?" Earlier this week the Globe and Mail reported that Grewal had accumulated debt amounting to more that $1 million and it was not known to whom the money was owed. CBC News learned this week that Grewal's most recent filing with the ethics commissioner's office showed he has been carrying lines of credit with three separate banks: RBC, TD Bank and Scotiabank. He also holds an HSBC mortgage with another individual. His assets listed in the ethics filing included joint ownership with another individual of a residential investment property in Toronto. That filing also shows Grewal has been earning employment income from ZGemi Inc., a general contractor located in Brampton, and from the law firm Gahir & Associates, on top of his MP's salary. The ethics filing does not reveal the amounts owed on the lines of credit or the mortgage. In addition, NDP MP Charlie Angus asked the ethics commissioner to investigate Grewal for inviting Yusuf Yenilmez, CEO of ZGemi Inc., to a number of receptions in India during the prime minister's trip there in February. That ethics investigation has not been completed. In the video, Grewal said those accusations have muddied the facts. "As commonly happens when a news story like this one breaks, many want to know the details and may rely upon isolated pieces of information and half truths in an attempt to fit them into the narrative." Grewal says questions he asked in February and June as a member of the Standing Committee on Finance about money laundering were ethical, and not an attempt to deduce if the Commons knew about his gambling habits. He also spoke of rumours about the price of a Toronto condo owned by him and his wife, which he says was purchased for $1.44 million, with a mortgage of $1 million. "The media has implied that the mortgage is in excess of its purchase price, which is not true." Grewal confirmed the reported lines of credit with three different financial institutions, which he said are related to his student debt. On Friday, the National Post reported the City of Brampton has asked the RCMP to look into a multimillion-dollar land for property purchase by Goreway Heaven Inc. after confidential information on the transaction was allegedly passed to Liberal MPs Navdeep Bains and Raj Grewal. After that report suggested he may have leaked the price to the company — which reportedly has ties to the Liberal party — Grewal fiercely denied it. "I have routinely requested updates on the status of the project from the mayor's office. The sole purpose of my inquiries was to ensure that I could provide an update to my constituents on the status of the project." Grewal said he did receive an "unsolicited confidential report" from the mayor's office, but "to suggest that I leaked confidential information is categorically false." The RCMP and Peel Regional Police have declined to comment.